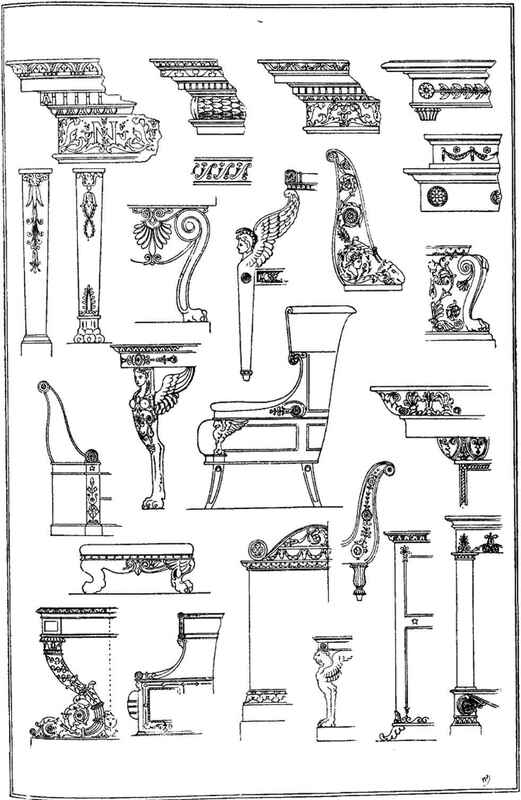 " Classic " capitals—particularly the "Corinthian ;" the " egg/' and 44 egg-and-tongue " mouldings ; 44 pearl" beading; the sacrificial heads—bullocks1 rams', etc. ; stiff festoons of drapery; sphinxes, lions, eagles, and other figures, mythological, animal, and human. The enrichment of Fig, 4, Plate II., is as comprehensive an object lesson in the decorative elements of this period as could well be found in a single example. In addition to the employment of brass in the form of mounts such as those illustrated and described, simple lines of the same metal were, very frequently, inlaid into the mahogany, with very chaste and pleasing results. 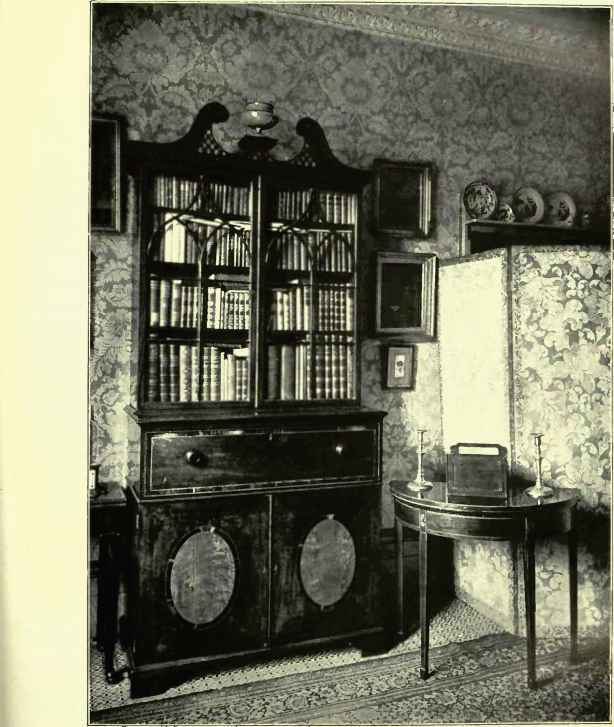 Reverting, for a moment, to chairs and seats, I may mention that, when not made in mahogany, with brass mounts or gilded carving, they were painted in light and subtle shades of cream, green, pink, or blue, and touched up here and there with gilt, the mouldings and ornaments generally being thrown into prominence in that way. Gilt, in one guise or another, was a very prominent feature throughout the Napoleonic furnishing era in France, which, from more than one point of view, may be, perhaps, regarded as an age of brass. A word or two, in conclusion, with regard to the character of the design of the 44 Empire " textile fabrics used for furniture coverings and draperies. Sometimes they were bold, free, and floral in treatment, as in the coverings of Fig. 4, Plate I., and Figs. 1 and 3, Plate II., but more generally they were stiff and conventional, as in Fig. 3, Plate Iv Fig. 6, Plate III., and Figs. 1, 2, and 6, Plate IV. The pattern was often composed solely of a "powdering," which consisted of a simple wreath, or even of the Imperial Bee alone, without any decorative accompaniment.